Bolivia’s national contribution to the COP 21 describes capitalism as “a system of death” that has to be destroyed to protect humanity and Mother Earth. EURACTIV France reports. The Bolivian government’s slightly late national contribution to the COP 21 contains many radical proposals for safeguarding the future health of the planet, accompanied by the argument that capitalism is responsible for “consumerism, warmongering and […] the destruction of Mother Earth”. Some 122 countries have now shared their national contributions to the international climate conference in Paris, where countries will attempt to reach an agreement that will limit the global temperature rise to +2°C above pre-industrial times. The texts contain many different proposals for reducing CO2 emissions, financing climate change adaptation and mitigation efforts and transferring technologies to developing countries. 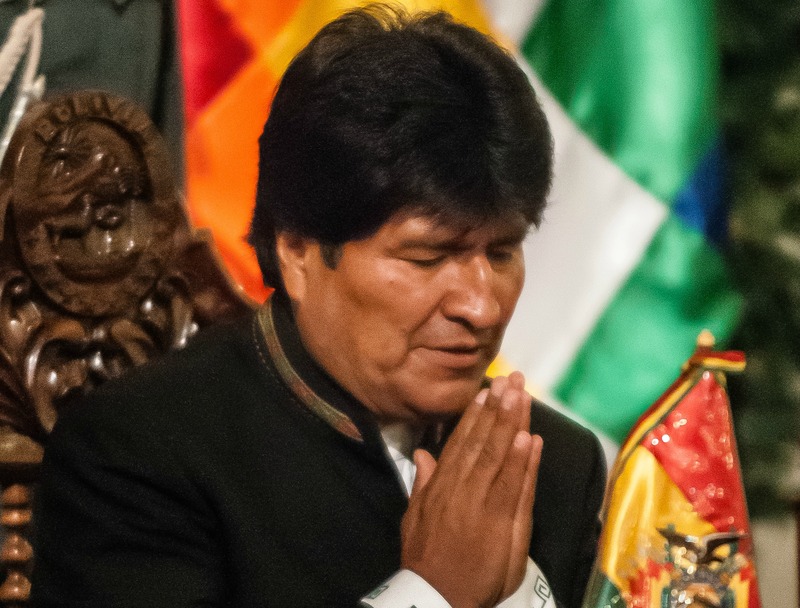 But the South American country led by Evo Morales took advantage of the alternative World People’s Conference on Climate Change and the Defence of Life, held in Bolivia from 10 to 12 October, to advance some alternative ideas. Bolivia, whose constitution already guarantees the respect of Mother Earth, holds “the failed capitalist system” responsible for climate change. “For a lasting solution to the climate crisis we must destroy capitalism,” the national contribution states. The Bolivian text does not stop at the denunciation of capitalism, but offers ten structural solutions to the climate crisis, including a guarantee for the protection of the rights of Mother Earth, the recognition by governments of the right to water and the elimination of technology patents in favour of a human right to science. Another central proposal is the “establishment of an International Court of Justice for the Climate and Mother Earth,” which would ensure that all countries fulfil their climate obligations. The idea of international climate justice is nothing new in Bolivia. Evo Morales had already called for the establishment of an international climate court, at the Copenhagen climate conference in 2009. No international tribunal currently has the competency to judge climate crimes. As a result, climate justice is left to individual countries, and legislation varies considerably from one to another. The Bolivian text expands on the idea of climate justice and proposes a system for sharing global greenhouse gas emissions. Using the estimate made by the Intergovernmental Panel on Climate Change (IPCC) that 650 gigatons of CO2 emissions would lead to a temperature rise of 1.5°C by 2050, Bolivia proposed a carbon budget for each country, limiting its right to pollute. This carbon budget would apply to both developed and developing countries, and would be based on a climate justice index defined by a country’s level of development, its historic responsibility for climate change, its ecological footprint and its technological capacity. Applying this index would allow the remaining carbon budget to be shared out fairly among developed countries, which are largely responsible for climate change, and developing countries, which are often its first victims. According to Bolivia’s calculations, this system would assign 11% of the remaining carbon budget to developed countries and 89% to developing countries. Developed countries currently account for around 20% of the global population. But these countries (including the United States, Japan, France, the United Kingdom, etc.) emit four times more greenhouse gasses per inhabitant than developing countries. The 20th COP took place in Lima, Peru, from 1 to 12 December 2014, and Paris is hosting the all-important 21st conference in December 2015. The EU’s contribution to the UN agreement is based on deal reached by EU leaders in October 2014. It sets out a binding emissions reduction goal of at least 40% by 2030 compared to 1990. The objective is described in the agreement as “a binding, economy-wide reduction target, covering all sectors and all sources of emissions, including agriculture, forestry and other land uses”. Agreeing on a UN framework, whether legally binding or not, is the priority between now and December. Better to destroy animal agriculture first. The socialist countries also commit atrocities against farmed animals. Though still largely ignored, the main source of greenhouse gases (51% annually worldwide) are so-called livestock, NOT transportation. Methane and nitrous oxide are far more dangerous than carbon dioxide, yet even carbon dioxide is produced in massive quantities by animal farms. (See the recent documentary COWSPIRACY and the 2009 Worldwatch Institute study “Livestock and Climate Change” by Anhang and Goodland.) To end the meat, egg, fish, and dairy industries would already be a giant step toward ending capitalism–and reversing climate catastrophe.